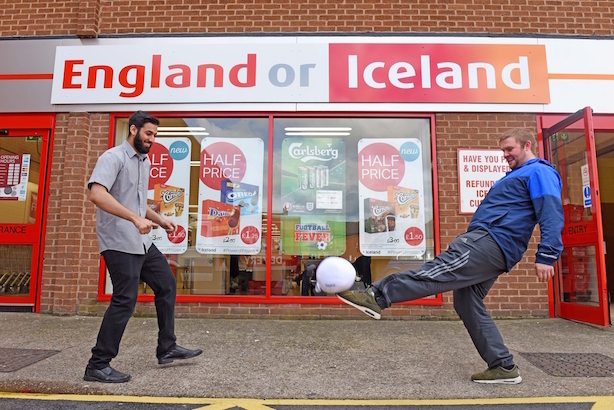 The supermarket Iceland has changed the name of one of its stores to 'England or Iceland' ahead of the knockout game between the two countries during Euro 2016. The temporary store name will be in effect for 24 hours. Area manager Steve Cropper explained the decision: "We love England, but we love Iceland too of course. So in order to honour both our actual country and our namesake country, we have renamed our store England or Iceland. "We decided of course to do this at our Leicester store – the city renowned for achieving great things despite being an underdog. The great thing for us is that whatever the result, one of our teams will win." The supermarket chain decided to sponsor the Icelandic football team after fans inundated the supermarket with ‘congratulatory’ tweets and messages when the nation qualified for Euro 2016. Throughout the tournament, Iceland has been carrying out promotions to celebrate the partnership and made a video explaining the tie-up.